Our staff is always there to help you with your insurance claims and answer any questions regarding your insurance coverage. Please bring your insurance information with you to each visit so we can keep your records current. At the time of service, our staff will do their best in providing an estimate of your patient portion due. However, final financial payment can only be determined by your insurance company. As a result, you are responsible for the payment of all professional fees regardless of the extent of coverage. At the end of your visit, we'll provide you with a copy of your treatment plan to take home and the date for your follow-up appointment. It's understandable to have questions along the way and we'll always be there to answer each and every concern. We look forward to giving you a healthy smile. After the dentist finishes up with your exam, our financial co-ordinator will sit down with you. The goal is to answer any questions or concerns you might have, like what sort of payment options are going to work out best to meet your dental needs and your budget. Ideal Smiles Dentistry accepts cash, major Credit Cards including Visa, MasterCard and Discover. We deliver the finest care at the most reasonable cost to our patients, therefore payment is due at the time service is rendered unless other arrangements have been made in advance. If you have questions regarding your account, please contact us at (757) 962-7000. Many times, a simple telephone call will clear any misunderstandings. We also offer Care Credit which will provide you with convenient interest-free options and the ability to pay for care over time with low monthly payments. I walked in on a FRIDAY for a root canal after being stood up by another dentist. They were able to perform not one, but two root canals while being EXTREMELY patient and caring as I literally had a panic attack. Awesome customer service! The staff here and Dr. Zahir are all both warm, friendly, and professional. I love their dental hygienists---very personable and they do a great job! Their scheduling process is very easy and I never have a long wait when I am there. My initial visit to this clinic showed me why so many others have rated it so highly. From the lady at the front desk to the dental assistant, the sincere care and professionalism was par excellent. Dr. Shabana saw me and exhibited an unusual degree of concern, caring and professionalism. This clinic demonstrated to me a degree of friendliness and authentic caring beyond what I could have hoped for. I would definitely pass on to my friends..
Dr. Zahir is THE BEST DENTIST!!! She always makes me feel like she cares. Her staff is amazing! I will forever come to her as my dentist. I have been going to this dentist since last year July, and from the moment I walked in I felt at peace and when I met Dr. Shabana Zahir I felt the the passion she has for her job. Today was a big day for my smile and although we are not done with our work, I am in love with the outcome. I have never had a bad experience with any of the staff they are so loving and understanding and really strive to make you feel comfortable. There were a few times where I did have to wait a little longer then normal when it got busy but I would never walk away or complain because the work they do and the service you will receive is totally worth it. Dr. Zahir is a perfectionist and I love that I would absolutely recommend her and her office. I will definitely be going back to complete my work. I had my first dental check up today in 6 years and am I glad I chose to ideal smiles dentistry! I needed quite some work done but they assured me everything will be okay and I’m in great hands and I was. This dentistry is professional, clean and has a great atmosphere. I needed 3 fillings and dr Zahir took care of me in an acceptional timely manor. She made sure I knew what to expect and kept checking up on me throughout the entire filling process. I am so relieved and now have a dentistry I can take my entire family to. Thank you all!! Look no further, this place is wonderful. The staff is super friendly and Dr. Shabana Zahir is lovely. I've had multiple teeth filled and 2 cleaning after over 10 years of being scared to see the dentist. Best dentist I've ever been to. She is fast, friendly and very patient. I have super sensative teeth and she always made sure I was ok during my visits. She will show you her work and explain what was done and answers any questions you have. I had a great experience the staff was friendly and made you feel comfortable. Fast and explained every question if you had any. I am going to recommend my friends and family to go there! The staff is friendly and professional. The lady who took X-rays and cleaned my teeth was very pleasant and professional. The dentist was great and took time to explain the treatment needed to fix my teeth. I had lot of work done and I'm very happy with this practice. I would recommend it to everyone. Dr. Zahir and her staff is amazing! She is incredibly gentle and very patient! I was very impressed how quickly they got me in being a new patient that needed a cleaning, X-rays, and fillings. She is also open every other Saturday which really helps people that normally can't make their appointments during the week. If you are currently looking for a dentist you will not go wrong with Dr. Zahir and staff!!! I don't usually do reviews but,I recently cracked my took and was so afraid to go to the dentist because of the bad experiences in the past.I got an appt so fast, and Dr. Zahir and her staff is so loving, and caring.I had no pain and everthing went so smoothly. I knew i was in the right place when i entered Ideal Smiles Dentistry. I was greeted with a smile and she had the greatest spirit. The personnel there seem to be so professional and caring. I had the best experience ever. Thanks so much! I LOVE YOU Ideal Smiles Dentistry!The best dentistry ever! Very clean, professional. The ladies were very nice and made sure to make me feel comfortable. I went on a saturday, their busiest day, but was seen right on time. I hadn't been to the dentist in years, so even though I was nervous, they were very good to me, and not judgemental. I did not spend a lot of time with the main Dr., but she was precise and to the point. Efficient. I will be returning to have my tooth pulled and I am glad I will be going there to do. My insurance doesn't cover much, but their prices are reasonable, and it is worth paying for the proper care and people who want to ensure your comfort and least amount of pain. Thanks ladies! I am amazed at this wonderful place! They not only fixed my smile, but they broke my fear of the dentist! I wanted to cry tears of joy when I saw the results! They helped boost my confidence back and im HAPPY TO SMILE AGAIN! Just got my teeth fixed!! Can't even tell I had a hole in my front tooth!!! I recently started going to ideal smiles & I absolutely love it there. The office is so clean and bright. All of the employees are great especially Kristen & Dr.Zahir. I had a wisdom tooth pulled by Dr.Zahir with minimal to no pain & I just recently got the most thorough teeth cleaning I’ve ever had! I’d recommend them to anyone! Super staff I just love them. The office is imaculate & staff plus doctor are amazing!!!!!! Go you won’t be sorry :). I came in one Saturday morning in excruciating pain. My tooth was extracted and now i have a temporary bridge and it looks great. The staff is very friendly and they all take good care of you, especially the dentist. I was very pleased with the services. Both myself and my husband are patients at Ideal Smiles Dentistry. In addition to receiving excellent dental care, we are always greeted by the helpful and friendly front desk staff, and each hygienist we have had takes such good care of us. Dr. Zahir is very thorough in her care and we both have better smiles because of her and her team! I would highly recommend this practice. Dr. Zahir is absolutely fantastic as well as the entire staff at the office. I'm a very anxious patient in the dentist's office, but they worked with me to get what I needed done in the best way possible. I cannot express how grateful I am or how highly I recommend this office and these people. Fantastic experience. Will never go anywhere else. Thanking the doctor for her compassion and getting me in quickly the same day. I would recommend Ideal Smiles to all my friends and family. I took my 20 month old daughter to her first dentist appointment here. The staff was very kind and welcoming and professional. They went out of their way to make my daughter comfortable and made for a great experience. I most certainly recommend Ideal Smiles in Va Beach to my friends and family! This is by far the best dental office I've been to! I've been going there for 2 years now. Dr. Zahir is very gentle and professional! The whole staff is super friendly and they make you feel comfortable during your whole visit! They even have tv's in each room for your own convenience! Very clean office and nicely organized. I highly recommend Ideal Smiles Dentistry to all my family and friends. I have had multiple visits at Ideal Smiles Dentistry. Each visit with Dr. Zahir and her team have been very pleasant. If I had any questions, concerns, discomforts or comments the team was ready and willing to provide any adjustments needed and answer any questions. With being pregnant I was very concerned about getting a root canal, a few fillings and two extractions done. However, Dr. Zahir made me feel at ease with all procedures and did everything in a timely manner. I will definitely be recommending Ideal Smiles Dentistry to all my friends and family. All of the people at Ideal Smiles are wonderful. From the personal at the front to the techs to the Dentist. All top notch and professional. They made me feel at ease. I would recommend them to everyone. Had extraction done to lower back tooth Yesturday, ready to eat a steak Today! Omg, easiest extraction I've ever experienced, and much less "brutal" than My experiences with other Dentists in the past! Thank You so much for everything Ideal Smiles ,Va. Beach!!!!!!!!! I began treatment here while I was pregnant with my son last year. I had to have 2 root canals done during that time. Doc was wonderful and so was all her staff. I wouldn't have thought to take my son anywhere else for his very first trip to the dentist. They were very sweet and made him comfortable. I couldn't ask for a better dental practice. Love them! Dr. Zahir and her staff are very professional and comforting. I have always been nervous about going to the dentist, but they were reassuring and made the experience very positive. Although I had been seeing a dentist every six months for years, my teeth were deteriorating badly. I am thankful they were able to help me move towards a nicer smile and healthier teeth. I highly recommend Dr. Zahir! My experience was great staff and doctor was so pleasant I will definitely be back and will refer anybody I know. It's also very clean I'm there. Appointment didn't take long at all. I was well informed and walked through the procedure beforehand. Very professional and great service. Dr. Zahir and the entire staff at Ideal Smiles is just simply amazing! From the time you walk in until the time you get out of the chair, everyone is friendly and welcoming. 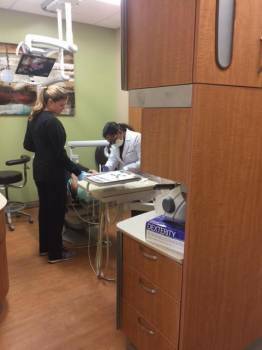 I was terrified to be seen because of two previous bad experiences with other dentists. However, Dr. Zahir and her team have changed all of that for me now. She was very accommodating. I'm just really grateful and happy to have found a new dentist who I can trust to do all of my dental work. Dr. Z was amazing. My husband has not been able to chew gum in 6 years. It took him 6 years to go to the dentist. He had fear of going to the dentist. But Dr. Z really educated him and made him feel better. She literally helped remove fears. We loved how she took her time to teach him before she worked on him. Her staff was very friendly and the office was very clean. Thank you. We totally recommend this place!!! What a wonderful and professional experience. Dr. Zahir is a skilled professional and her staff are truly amazing. They make you feel as if you were part of the family. I appreciate Dr. Zahir's taking the time to explain the procedures to me and making me feel comfortable. A true professional. They took amazing care of me last fall when I needed a substantial amount of dental work. Dr. Zahir is amazing and the staff really care about you. I also really appreciate them being able to give cost estimates so I can be prepared. I have found my new dentist for many years to come. I went there last tuesday to get checked out because I was in so much pain. I went in and had 20 x-rays on my mouth and they said I needed a deep clean to correct the problem. I went that friday and had part 1 of the deep clean performed. Crystal was very professional and I felt no pain. The staff is amazing and so friendly! They are always incredibly welcoming and professional. Dr. Zahir is understanding and flexible when it comes to working with patients, which is necessary for someone like myself in the military. Very glad I chose this office! Going to the dentist is never fun but Dr. Zahir and her staff made it as pleasant as possible. In fact they went out of their way to accommodate my needs. If you are looking for a family dentist I highly recommend this practice. I must say this is one of the best dental experiences that I've ever had. The whole experience from making the appointment, coming into the office to the pleasant personalities of the staff and meeting Dr. Zahir . Every process was explained step by step as she proceeded. Thank you so much for the exceptional job and making me feel comfortable through it all. Little by little I am regaining my smile thanks to the awesome people at ideal dentistry in VA Beach! They even made time to bring me in on a closed day. Dr. Zahir and her dental assistant Julie and the rest of the staff are amazing and kind, they definitely break the dentist stereo types. No words can describe my experience that I have with this dentist office! The staff is super friendly and the Dr is even friendlier! They make every appointment pleasant (considering)! I can't even put into words how thankful I am for them and all the effort they are putting into making sure I get my smile back! Amazing people who have changed my life. So thankful for all they've done! I am usually terrified to go to the dentist but Dr.Zahir and her staff are absolutely amazing. I recommend Ideal Smiles Dentistry to any and everyone who is looking for a perfect dentist. Ideal Smiles Dentistry is the BEST!!! I went to Ideal Smile to get my tooth taken out it was so fast and painless and I had a terrible experience with dentists before but this time she and her staff was very nice and warm people so it put me at ease. I cracked my tooth on Thanksgiving and I am confident that she can fix it with an affordable price. Sent an appointment request online and received a call back almost immediately. We were also given an appointment the same day. They have a lovely office, friendly and helpful staff and a very quick and thorough dentist. My daughter was in no pain as she received treatment. They more than took care of her dental needs. They exceeded my expectations. Very pleased, happy to go back and excited to recommend to others. Thank you! Dr. Zahir and her staff are the best in town. She and her staff were polite, proffessional and caring to my needs. I went in with a tooth that cause me sooooo much pain and Dr. Zahir relieved me of the pain. Im and were usually tense about going to the dentist, but they removed it WITH NO PAIN!!! !......This is definitely my favorite place to go and in the near future for my appointments. GREAT JOB GUYS!!! This dentist office is clean and beautiful! The staff is great and Elaine at the front desk is super friendly and welcoming! I am very happy with my decision to start coming here!! I had been in pain for 3 days, trying to wait it out to get into a dentist I came Ideal smiles and they saw me immediately and not only fixed my problem but set up a treatment plan to make sure I never have to go thru that again! I am really thankfull that I found them to help and become my new dentist! Was able to get a appointment quick for my kids. Walked in and the staff greated. Everyone was so nice. It was my daughter first time going to a dentist and they made her feel very comfortable. They took time to show her all the tools and even let her help! The staff is very nice and the doctor is great too! I had an amazing experience! Highly recommended!! Dr. Zahir is very friendly and knowledgeable. She taught me something new about the deep pockets around the teeth. Ashley and Alyssa are sweethearts, gentle, and very kind. They are genuine and one of the most down-to-earth persons you will ever meet. The staffs at the front desk are super funny! Everyone remembers my name in one visit, and they always give me sincere smiles. :) The place itself is super nice. They have TVs, magazines, etc. I have had wonderful times on my visits. What I like most about this place is simply the fact that they interacted with me, while they were cleaning my teeth. I highly recommend and encourage this place for anyone, who is looking forward to have enjoyable conversations and great experiences with staffs. Incredibly friendly staff! They were thorough and made sure I was always comfortable! Dr. Zahir is highly professional, honest and ethical. I would recommend Ideal Smiles to anyone I know. After not having been to the dentist in a number of years, I was extremely nervous and worried about my upcoming appointment. From the moment I scheduled my appointment, to the actual dental procedures being done, Ideal Smiles' entire staff has been absolutely wonderful. I was comfortable throughout my procedures, and kept informed about what needed to be done every step of the way. I was even entertained during my appointment! I needed to have quite a bit of work done and Dr. Zahir has been awesome. My entire family uses Ideal Smiles and we couldn't be more pleased. If I moved out of this area, I can honestly say, I would still make the trip just to have any future check ups and work done at Ideal Smiles. That's how awesome they are! A awesome dentist and a awesome staff. Very professional yet made my daughter and I feel very comfortable..
Dr. Zahir and entire staff of Ideal Smiles are very polite and fun. Everytime I come to my appointment, there is no dull moment. I love how they joke around each other, making the whole expirience light and fun as possible. I love Joy and Ashley as my DA and along with Dr. Z, them 3 will just make you smile and laugh. Also, I love when Dr. Z follow up on her patients at the end of the day to see how they are doing after a major procedure. I highly recommend Ideal Smiles. I'm happy that I found this office.